The Refreshments prided itself on being something like a democracy. Everyone had a say in band issues, and we all participated in songwriting. That’s why it’s a little uncomfortable to talk about which band member wrote which song. The short answer is, we all wrote them. Still, if put against a wall, I could come up with a single writer for most of the Refreshments tunes. The songs I “wrote” were “Carefree,” which is on our first record, and “Birds Sing,” which is on our second. “Carefree" cemented itself early as a staple of the band's set and identity. It was one of five songs we played at our first practice. It was also the lead-off song for the band’s first few months of shows. I never worried whether it would have a place on our first record. I had no such gimme for our second record. As we rehearsed new material for the record that would become The Bottle and Fresh Horses, I tracked songs on my four-track recorder at home. Eventually, I came to practice with eight songs, none of which found favor with the band. I realized that if I was going to have a song on our new record, I would need to come up with something good, and quick. I wrote “Birds Sing” in about fifteen minutes. (Where these things come from I’ll never know, but it was out there, and I got it, so it's mine.) I took it to our next practice, played it on acoustic for the guys, and by the grace of Yahweh I had a song for our second record. Now, I’ve demoed a new version of Birds Sing for posterity. It’s called “Birds Sing Redux,” and you can listen to your heart’s content at my MySpace Music Page. Second, email me your name and where you live. I’ll add your name to my email list and send the mp3 of “Birds Sing Redux” to you as an attachment. Put “Birds Sing” in the subject line, and I’ll know what you want. That’s it: blog subscription, an email with your info, and you’ll have a copy of “Birds Sing Redux” in your inbox by the next morning. Sound good? This is a big moment for me. When I started this blog, I imagined someday writing this--there is no other word for it--confession. I want to tell you about the only fan letter I’ve ever written. It happened on a Saturday afternoon in 1983 in Moline, Illinois, my hometown. I was fourteen years old, and I’d just come home with an album from the record store. I’d been reading about this artist for at least a week, and I couldn’t wait to hear him, this Swedish virtuoso careering over the American music scene--or perhaps flying in on a dragon--leaving nothing but a scorched land and blown away ax slingers in his wake. The artist was Yngwie [pronounced ING'-vay] Malmsteen. The album was Yngwie Malmsteen’s Rising Force . 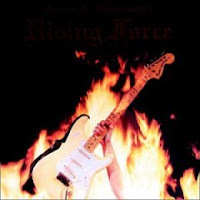 The cover of the album featured Yngwie’s white Stratocaster and a hand, presumably Yngwie’s, reaching up and clutching it from a bed of flames. Classic D & D stuff. The music was as other-worldly as Yngwie’s impossible-then-suddenly-easy-to-pronounce name. Of the ten tracks, eight were instrumental, and each featured Yngwie’s blistering, classically-influenced leads. It’s hard to explain the effect of his signature lick, which is called “stacked fifths,” but when hearing it I always imagined a million little bubbles floating to the surface of water. His technique was “bubbly,” easy to understand, impossible to emulate. I was so blown away I did something I’d never done before. I searched out a pen and paper, sat down on my bedroom floor, and while the album played, I wrote Yngwie a letter. I don’t know why exactly I needed to do this. I’d been blown away by music before, but this artist was somehow more important, more monumentally life-changing, and I had to tell him about it. I also wanted to commemorate the moment, and all I could think to do was to write Yngwie a letter. I don’t have a copy of that letter, but I imagine I told Yngwie how much I thought he laid down the law, how totally pumped I was about his music, how much I looked forward to going to one of his concerts one day. I also probably had some disparaging words for Yngwie’s contemporaries: Steve Vai, Eddie Van Halen, and Joe Satriani. Unfortunately, I can't do justice to the best Yngwie story ever told. That honor belongs to Peter Lubin, former A & R man of the Refreshments and unmatched reconteur. If you ever run into Peter at a bar, don’t ask him, force him to tell you his Yngwie story. Then, buy a beer and sit down. Make Peter start with his record company's president wrapping his arm around him and saying, “Peter, why are you fighting me? I’m trying to make you a rich man.” Then, tell the bartender to have a bar rag ready, because beer will come spurting out your nose at some point. So, that’s it. That’s the one and only fan letter I've ever written. Do you have an earnest if somewhat embarrassing fan letter in your past? Share it with all of us in the comments section. I’d love to hear about it. Author readings are like Yoga class to me; sometimes they can be a bit tough to make it to, but once I’m there I’m always glad I came. I usually pick up something about writing, or the author, or the author’s topic I’m glad to know. I almost always learn something about reading for an audience I didn’t know. I get to hang out at a bookstore for an hour, which is never a waste of time in my book. When I read to an audience, I always make an effort to read slowly and clearly. I like to read for people, and I think people like to hear me read. Still, in 2004, that didn’t keep me from trying to jazz it up a bit. What we didn’t find around town we recorded ourselves, like the boot stomps of truckers, the clip-clop of a woman’s shoes, the ripping of a ticket. I recruited Jim Gerke to act a few of the bits, and PH Naffah edited everything. In the end, we had background noise for each of the four excerpts, and dozens of sound effects. We performed this act a few times, and the people who saw it loved it. Luckily, for those of you who didn’t make it, we preserved the reading parts for posterity. (It’s the digital age; nothing ever has to go away completely.) You can now download the excerpts for free from my MySpace Music Page and listen to them at your leisure. There’s lots of fun stuff interspersed with the reading (For example, you may recognize the muzak in the convenience store scene), and we definitely had a blast doing it. If you’re interested, please download them soon, because in the next month I’m going to start replacing these excerpts with other stuff. Free downloads, man. What are you waiting for? Despite a lack of readers, people still want to write. They keep submitting their work to publishers and literary agencies, applying to creative writing school, composing blogs, not to mention all of the budding literary stars who someday want to write their life stories, or the great American novel. Writers simply don’t care how many people read their work. They want to write--that’s all there is to it--to say they’ve done it, to read it themselves one day, and sometimes not even that. As a writer and publisher of my own work, I guess I should be upset by this trend. I know others are. It’s so easy to write and publish these days (take this blog; I started this piece Sunday morning, and by Monday morning it’s live to the world). All of that competition for readers’ attention can’t help but dilute the attention my work gets. Shouldn’t there be some kind of qualification to write, a litmus test of literary competence, an easier way to separate the wheat from the chafe? I don’t think so. I think writing is a fantastic way for people to clarify their ideas, to validate themselves to themselves, to express themselves to the world. Instead, I decided to write a blog outlining my tips for people who want to start writing. Still, that seemed too pretentious. In my four years as a published writer, no one has ever asked me about this. Who cares? So, I changed my topic again: why I think it’s great so many people write and publish these days. Hence, by the time I’d written word one of this blog, I’d already winnowed my topic down from a list of six, and refined it twice. This editing carries over to the rest of the piece. Writing is a great way to fully understand how well, or little, you grasp your ideas. A faulty sentence rings untrue; it can make you sound hot-headed, or precious, or dim-witted, or full of yourself. “That’s not what I mean,” you say upon re-reading. Refining my original topic was simply the first of dozens (hundreds? thousands?) of little revisions that go into honing my final blog entry. Sometimes, clarity is achieved simply by going from a blanket comment, like “I know,” to something more general, like “I strongly believe.” Many of us could do with having to clarify ourselves from time to time. It might keep us from doing something stupid. If writers do one thing besides compose words, they reflect. The world could use as much of that as possible. When I was twenty-one, I used to go see a local band, Dead Hot Workshop, anywhere they played (This is Tempe, AZ, 1990). I was new to the city, the music scene, bars in general. I used to buy a pitcher of beer at nine o'clock, grab a stool with a good view at Long Wong's or the Sun Club, and wait for Dead Hot to start playing. I watched them all night, some nights I barely moved. Afterward, I stumbled home, picked up a guitar and tried to write songs as captivating as the ones I'd just heard. Dead Hot seemed the perfect combination of the Replacements, the Gin Blossoms (another local favorite) and, because of the lead singer's, Brent Babb’s, unique skill with lyric and melody, Bob Dylan. (Okay, maybe that's taking it too far--but dammit, he was our Bob Dylan.) I used to think, having been hardly anywhere else in my life, "If a band this good exists right here in Tempe, just think how many other good bands there must be out there." After sixteen years, many tours around the country, relocating from Phoenix to San Francisco to Ashland, Oregon, I still haven't found another Dead Hot Workshop. I was just fortunate to have wound up Tempe, to have seen them open for the Gins at the Asylum on my twenty-first birthday, to have given them another chance after not quite getting them that first night. They're the only one, and after all this time that seems a point worth celebrating. A quick word about Brent Babb, the lead singer and chief songwriter--and it'll have to be quick because he's the rare talent who absolutely hates hearing himself talked about. No one else can so un-self-consciously combine in his lyrics humor, pathos, and pop culture--often in the same line--and all of those images and associations piled on top of each other create a richness and resonance I find unmatched, on Mill Avenue or anywhere else. Coupled with his simple, haunting melodies, Brent Babb is the finest songwriter most people will never hear, and that, as they say, is a shame. Sixteen years have passed since I used to go see Dead Hot on Friday nights, but Dead Hot is still there, playing every month or so around Phoenix and releasing Heavy Meadow last November. A new Dead Hot CD is always an event around my house, and I’m happy to report Babb’s connection with that place where all good pop comes from is as strong as ever. And now he’s teamed with his brother, Kylie, who carries on the family tradition on lead guitar, and a rhythm section, drummer Curtis Grippe and bassist G. Brian Scott, that has solidified into bedrock after a decade or two of gigs together. There’s only one Dead Hot Workshop. Those of us who know about them are just lucky. So, check out their MySpace page, their Web site, and for pete’s sake buy a copy of Heavy Meadow.